As fossil fuels such as oil and gas reach their peak production the world began to look for alternative, renewable and clean energy sources, including the solar energy. The conversion of energy from the sun into thermal or electrical energy is called as solar energy. It is the cleanest and most abundant renewable energy source available on earth. Even though the use of solar energy was evident throughout the history, the advent of technology has allowed harnessing it into an economically viable resource, which is competitive in the energy marketplace. Solar energy is primarily harnessed for electricity production through two main ways: solar thermal and solar photovoltaic (PV) cells. Solar thermal, the most traditional form, is a system of giant mirrors. They are arranged in such a way to concentrate the sun’s rays on a very small area to create significant amount of heat. It is used to create steam to power a turbine that creates electricity. 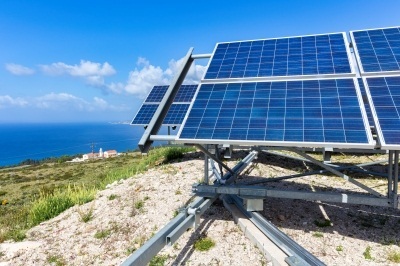 A PV cell, which is basically a semi-conductor connected to two electrical contacts, takes advantage of the photoelectric and photovoltaic effect to directly convert the sun’s radiation into electricity. Every one-and-half hour, the sun emits enough light to provide the entire planet’s energy needs for one entire year. However, as of 2016 it still represents just 1% of the world’s current energy mix. Now, the scenario is changing rapidly, driven by global action to improve energy access and supply security, and to mitigate climate change. 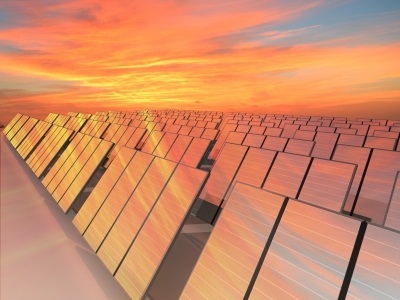 In addition, as the cost of photovoltaic modules and systems has fallen rapidly in the last few years, the number of grid-connected solar PV systems and utility-scale solar power stations has grown manifold across the globe. Image: Solar energy is the cleanest and most abundant renewable energy source available on earth. Photo: courtesy of Ben Schonewille at FreeDigitalPhotos.net. The International Energy Agency (IEA) projected in 2014 that by 2050 solar PV and solar thermal would contribute about 16 and 11%, respectively, of the worldwide electricity consumption and solar would be the world’s largest source of electricity. The Paris-based autonomous organization also given a forecast that majority of solar installations would be in China and India. According to IEA’s fifth edition of the ‘Snapshot of Global PV Markets’, the global cumulative solar PV installed capacity amounted to more than 303 GW at the end of 2016. China is the top nation with 78 GW of cumulative capacity, followed by Japan (42.8 GW), Germany (41.2 GW) and the US (40.3 GW) in 2016. Italy (19.3 GW) stood fifth and the UK occupied sixth slot with 11.6 GW. Image: Solar energy is primarily harnessed for electricity production through two main ways: solar thermal and solar photovoltaic (PV) cells. Photo: courtesy of David Castillo Dominici at FreeDigitalPhotos.net. The major pros and cons of the solar energy are detailed below. What are the cons of solar power? The most significant con of solar energy is that the initial cost of purchasing a solar system is fairly high. Even with multiple incentives, the installation cost for solar panels, inverter, batteries and wiring is expensive. However, as solar technologies are constantly evolving, it is safe to assume that prices will come down in the future. Solar energy is an intermittent energy source. As sun does not shine brightly 24 hours a day, solar power is produced during the daytime only. Predicting overcast days can be difficult. Even during the long days of summer, the sun’s direct rays can occasionally be covered by clouds. During that time the solar system is less efficient. Extremely high outdoor temperatures can also affect the efficiency of the solar system. This is why solar energy is not the first choice to meet the base load energy demand. Solar energy has to be used immediately or can be stored in large batteries. These batteries, used in off-the-grid solar systems, are charged during the day to use the energy during night time. Solar energy storage systems such as batteries are heavy and large, and are expensive. Installation of solar power systems may take up a lot of space and result in land degradation or habitat loss for wildlife. Power density (watt/m²) is vital while looking at how much power can be produced from a certain area of real estate of an energy source. Larger utility-scale PV systems may need up to 3.5 to 10 acres per megawatt. The global mean power density for solar radiation is 170 W/m². Although solar energy systems are less polluting compared to fossil fuels, the production of solar photovoltaics is associated with the emission of potent greenhouse gases such as nitrogen trifluoride and sulfur hexafluoride. Transportation and installation of solar power systems also indirectly contribute to environment pollution. What are the advantages of solar energy source? Unlike fossil fuels which are estimated to last only another few decades, solar energy is a truly renewable energy source. It is also sustainable as the needs of the present can be met without compromising the needs of the future generations. According to NASA, the sun is estimated to shine for another 6.5 billion years. Solar energy can be harnessed in all areas of the world and is available every day. Solar panels do not produce any harmful emissions during production, resulting in inconsequential impact on the environment compared to fossil fuels. Although there are some emissions associated with the production and installation of equipment nevertheless they are minimal. Furthermore, as there are no moving parts involved in solar power systems they produce power silently. Solar energy can be used for multiple purposes. It can be used to produce electricity in places that are devoid of grid connection, to distill water in regions with limited clean water supplies or even to power satellites in space. With the introduction of flexible thin-film solar cells, solar power can be easily integrated into the material of buildings. Solar installations are also scalable as it is easy to add or remove solar panels depending upon the space available. Solar energy systems generally require less maintenance as they do not involve any moving parts and last for about 20-25 years. Solar panels usually occupy few meters of space for residential use. They can be even installed in rooftops. They require cleaning a couple of times in a year. Installing solar panels and generating electricity reduces the dependency on fossil fuels, which in turn reduces electric bills. However, the amount will be dependent on the size of the solar system and usage of electricity or heat. Moreover, a solar panel system typically has a lifespan of 25-30 years, which means electricity bill savings will be long-term by going solar. In addition, if any surplus electricity is generated, it can be exported back to the grid or sold to utility companies to receive bonus payments.